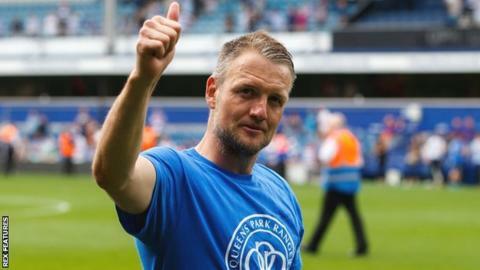 QPR have released former England goalkeeper Rob Green, defender Clint Hill and midfielder Alejandro Faurlin. Samba Diakite, Oscar Gobern, Armand Traore and Yun Suk-young will also leave Loftus Road when their contracts expire at the end of next month. Meanwhile, midfielder Karl Henry and winger Junior Hoilett are in talks about extending their deals. "There is no disguising we have had some very difficult decisions to make," manager Jimmy Floyd Hasselbaink said. Former Norwich and West Ham keeper Green made a total of 128 appearances for QPR after joining the west London club in the summer of 2012. The 36-year-old played 25 times this season, but his last outing came on 1 January. Centre-back Hill, 37, played 185 times in six seasons with the R's while Faurlin, 29, made 163 appearances during seven years with the club, despite suffering three serious knee injuries. QPR finished 12th in the Championship table this season.